Pertussis vaccine encephalopathy and epilepsy: The anti-vaccine movement started with whooping cough, not measles. A decade before the measles vaccine panic, parents feared this vaccine could harm their children. 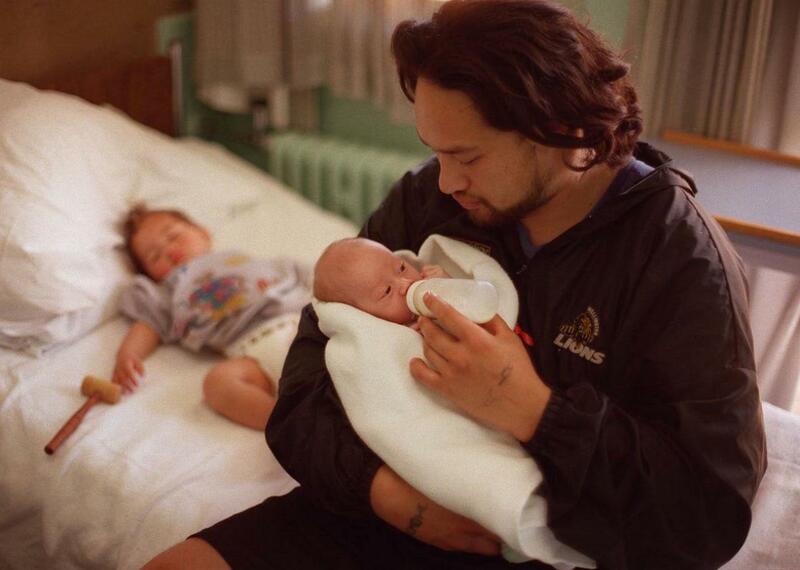 David Snook comforts his 1-month-old baby, Zane Flavell, who is recovering from whooping cough, in Middlemore Hospital, Auckland, New Zealand, on Oct. 18, 1999. Clinton ignored that advice, and she and her husband, Brian Lemar, cared for their daughter at home. Over the next few years, she met other parents whose children had seizure disorders. Naturally, they all sought answers to the same question: What caused it? Many of them, including Clinton, wondered if they were to blame. Clinton spoke with other parents, read medical books and journals, and pieced together the timeline of events that led up to Sarah’s first seizure. For Clinton, all fingers pointed to the pertussis vaccine, the P in DPT. A decade before Andrew Wakefield’s falsified research on the measles vaccine launched the current anti-vaccine movement, the pertussis vaccine, vilified for its supposed link to seizure disorders, came under similar attack. Today more than 10 percent of parents don’t follow the CDC’s recommended vaccination schedule for their children, delaying or splitting up the vaccines out of fear of complications like those Sarah experienced. Many selectively omit the pertussis component altogether. “The whole anti-vaccine movement in the U.S. started with pertussis,” says James Cherry, a pediatrician and pertussis vaccine expert at the David Geffen School of Medicine at the University of California–Los Angeles. Pertussis, or whooping cough, is a highly contagious disease caused by the bacteria Bordetella pertussis. It is often referred to as the “cough of 100 days” due to its characteristic cough, which you can see in the video—racking fits followed by a deep gasp—and its lingering effects. The disease occurs most often in children. Prior to the 1940s, the beginning of the vaccine era in the United States, pertussis sickened more than 200,000 children yearly, and killed nearly 4,000. The death rate peaked in 1934, when more than 7,500 children died from pertussis. Eventually, widespread vaccination programs reduced the number of U.S. cases by 99 percent. In recent years, however, pertussis has made a comeback. The disease tends to peak in late summer and early fall, and Kentucky and Ohio are already facing a severe outbreak this year. More outbreaks likely lie ahead. The pertussis vaccine acquired a bad reputation early. About half of all children who received the vaccine experienced a mild fever or redness at the injection site. Several studies conducted between the 1940s and 1970s linked the vaccine to more serious complications, like the seizures Sarah had, leading many parents to believe the vaccine was responsible. Many doctors—in the absence of a more plausible diagnosis—also believed there was a connection. Adding to the controversy, a 1982 NBC news program, Vaccine Roulette, further implicated the vaccines. Between 1980 and 1986, hundreds of parents, convinced of the link, sued the vaccine-makers—to the tune of $3.6 billion in alleged damages. In 1984, Alice and Brian Lemar filed a lawsuit against the makers of the vaccine that Sarah received. Evidence came from many sources, including the timeline, the testimony of several physicians, and the results of genetic testing that ruled out a family history of seizure disorders. But the most incriminating evidence came from the state of Tennessee. In the early 1980s, Tennessee health departments kept meticulous records of vaccine lot numbers and manufacturers. The records revealed that the lot from which Sarah’s vaccine was drawn was four times more potent (as measured in “mouse protection units”) than the recommended level. The night before the trial, the vaccine manufacturers opted to settle out of court. For many scientists, however, questions remained. What was it about the pertussis vaccine that linked it to seizures? “The old DPT vaccines contained the entire [pertussis bacterium] cell, so you got what we used to call a ‘dirty vaccine.’ There were a lot of [cellular] components in the vaccine in addition to the ones that provided immunity,” says Christian Coles, an epidemiologist at the Johns Hopkins Bloomberg School of Public Health and an expert in the control of pediatric infectious diseases. Pertussis vaccines were notoriously dirty, and often temporally associated with adverse events, such as seizures and sudden, unexplained death. Some children became pale, limp, and unresponsive after receiving the vaccine (later recovering with no long-term negative effects), while others—about 1 in 10,000 children—experienced febrile seizures and, like Sarah, long-lasting episodes of high-pitched crying. One of the cellular components in the whole-cell pertussis vaccine was an endotoxin produced by the pertussis bacterium. Endotoxins can elicit immune responses in humans, most notably fever. Even with mild fever, ranging from 100 to 101 degrees Fahrenheit, about 2 percent to 5 percent of all children will have febrile seizures, typically with no serious, long-term effects. Modern genetic analysis supports Cherry’s conclusions: Nearly all seizure disorders that occur in infancy or early childhood, even those that occur shortly after vaccination, are caused by genetic disorders. Nearly three-fourths of PVE cases have been attributed to Dravet syndrome, formerly referred to as severe myoclonic epilepsy. In Dravet syndrome, a mutation in the gene for a particular protein in the brain causes epileptic seizures. The condition is exceptionally rare—occurring in fewer than 1 in 30,000 children in the United States—and leads to intellectual disability and lifelong severe seizures. A cruel twist: Many commonly used anti-seizure medications exacerbate seizures in patients with Dravet syndrome. Other instances of previously diagnosed PVE have been linked to another genetic disorder, Angelman syndrome, made famous by actor Colin Farrell, whose son has the condition. Angelman syndrome, like Dravet, is rare, with prevalence estimated at 1 in 15,000 children. Although both Dravet and Angelman syndromes are caused by genetic mutations, the mutations are rarely inherited; instead they are new mutations that occur during conception. The mutations aren’t present in the parents and can’t be detected through parental genetic testing. Many children who were diagnosed with pertussis vaccine encephalopathy were not harmed by a vaccine at all; they had a clear genetic basis for their disease. Furthermore, the assumption was flawed that a more potent vaccine, like the one Sarah received, caused harm. Paul Offit, chief of the Division of Infectious Diseases at the Children’s Hospital of Philadelphia, explains, “Animal model studies were designed to gauge protective efficacy, not safety.” Mouse protection units were a measure of a vaccine’s potency for the purposes of vaccine production—a sort of quality control. “[Having] more protective units was a good thing,” says Offit. Despite the progressive nature of Sarah’s seizure disorder, Alice Clinton cared for her at home for more than two decades. “She began having grand mal seizures—sometimes hundreds a day—that lasted 30 seconds to a couple of minutes or more,” says Clinton. Sarah’s medications numbered in the teens. The frequent, severe seizures and long-term anticonvulsant drug use damaged Sarah’s brain, and although she learned to walk with assistance, she never spoke. She did communicate, however. “You could get a message from her looks, like a true Southern woman,” Clinton says, laughing. Stories like Sarah’s are tragic and harrowing. They rarely tell the whole story, however, and frequently are mired in investigational bias, historically inaccurate diagnoses, and the emotionally charged environment surrounding vaccines. But, even some 35 years later, they’re important stories to tell, especially in light of what’s been learned since then. Although a large body of evidence seems to exonerate the pertussis vaccine, a cloud of doubt surrounds it and other vaccines. The consequences are dire: Pertussis outbreaks sickened almost 33,000 children in 2014—15 percent more than CDC’s early counts from the previous year, and many times more than the better-publicized measles epidemic that spread to visitors at Disneyland. Both epidemics were due largely to low vaccination rates. Allaying those doubts ranks high on health officials’ agendas. Convincing parents that the pertussis vaccine can protect their children safely against a horrible disease is an important contribution to public health. But there is another benefit: assuaging the guilt and anguish experienced by so many parents of children whose seizure disorders closely followed their child’s vaccination. Physicians and public health officials can console parents with the knowledge that, as science advances, it unravels the mysteries of neurological disorders previously attributed to immunizations. They can reassure parents as to the true causes, and remove the blame parents may feel for having vaccinated their children.